What a terrible name for such a delicious food and gorgeous color. 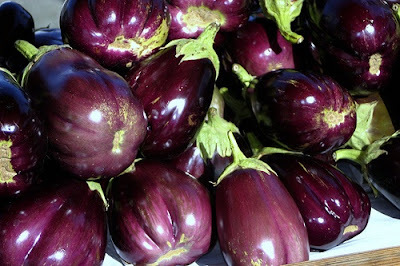 Last week they were on sale at our grocery store and we bought half a dozen and made some delicious eggplant parmesan. Interestingly enough, last week I also bought an eggplant long-sleeved shirt from the Gap. Eggplant on the brain. Here's a recipe similar to what we made and a few pieces I wouldn't mind wearing this summer that are (drum roll)... Eggplant! Kind of pricy for a tee shirt, but I like the details. I practically live in skirts, and this one's on sale! And if you haven't already seen it, take a look at Hermione Granger's... oops, I mean Emma Watson's spread in Teen Vogue. Notice a recurring color ;)? I usually try to post about things that are a little more meaningful to me than clothing, but I really just can't help it. I am craving this color! What colors do you crave? I love eggplants, it is very common in italian cooking. You should try Parmigiana, delicious! Have a happy sunshine day! they are a beautiful color! not sure i like the taste, though. i think i've only eaten it once.